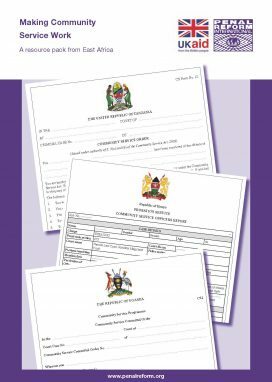 This pack provides information and material about how community service has developed as an alternative to imprisonment in Kenya, Uganda and Tanzania, and will be both of interest and practical use to individuals and organisations in other low income countries who want to develop similar policies. The pack includes extracts from legislation, policy documents and research reports from the region plus examples of practical resources that are used in the implementation of community service, such as forms, training and promotional material. It draws also on speeches and presentations made at a series of training events for magistrates and judges supported by PRI and held in the three countries in the first half of 2012. This resource pack follows on from another PRI report, Alternatives to imprisonment in East Africa: trends and challenges, which examined the development and practice of community service in these three countries.